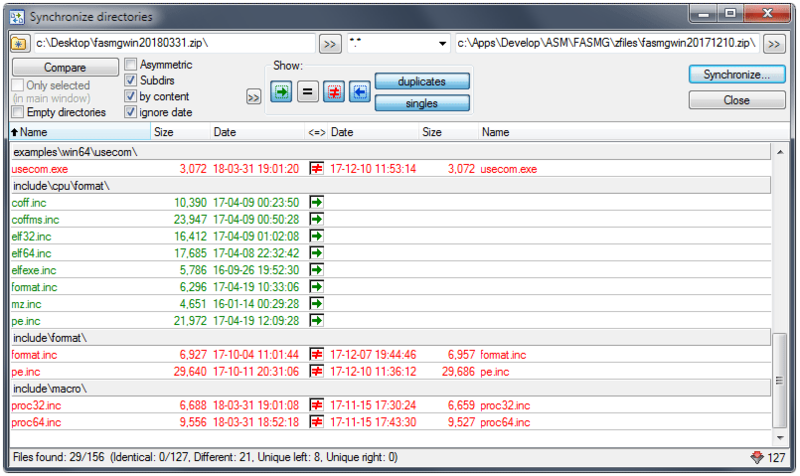 All the Windows headers of fasm 1 are now emulated, including syntax like ".if" and basic parameter count checking. The .if macro worked normally on, Thanks Thomas. The fasmg_win.zip used the same CPU insturction include files, but it used difference file "examples\x86\include\format\format.inc" both fasmg_win.zip and fasmg.zip, you maybe integrated the fasmg_win.zip into the fasmg.zip, it can help user to use it easier. I was curious if there is some reasoning behind the use of absolute paths in the include files? With relative paths it'd be possible to just INCLUDE '..\fasmg\include\win64w.inc' without it being broken. Maybe there is a use case I'm neglecting which relative paths would break? I wanted to say that it should not break anything, but wait, it breaks the "format" macros - they include files only when macro is called and the relative path is then of the file that called the macro. This could be fixed by changing INCLUDE to INCLUDE!, but this would make it read all the files unnecessarily only to define the format macros. Or, there is also an option of FORMAT.INC extracting its path from __FILE__ and then attaching this path to the name of every file it includes. I'm going to look into this solution to see how clean can I make it. Thank you, I was seeing other side effects as I don't have the environment defined and some includes weren't throwing any errors. Yet, it doesn't seem like they would be in the path. One would initially think that all includes would be in the context of the file that does the including. But if it's wrapped in a macro or eval, what then? I'll adapt - just confused. And by the way - when INCLUDE is used in a macro, the path it sees is of the file that called the macro and not the file that defined the macro exactly for the reason that you should be able to wrap things like INCLUDE with macros, etc. Excellent, now it appear to work from everywhere. You have stopped to update the file in the first post. Probably, it should be downloaded from another place now? Yes, I moved it to GitHub, though the headers themselves had no updates recently. This is the first thing that came to my mind. Any other suggestions? By using PE.INC directly you also have access to more settings, including ones not available with fasm-like syntax. Thanks for the answer and your program! ...if the section is empty. I know - a strange corner case. Modern Windows (based on NT kernel) rejects to load a PE file containing an empty section (one that has virtual size set to zero). Other implementations, like Windows 9x or Win32s, did not object to such setup. On the other hand, Windows 9x interpreted relocation data containing no records as a signal that the image could not be loaded at another address. Therefore a DLL with .reloc section of zero length could fail both on Windows 9x and NT, but for very different reasons. Win32s was the least fussy. It was not troubled by zero-length sections and correctly interpreted an empty but present relocation data. In other words: this is not invalid PE if we go by specification only. And it is considered invalid by some implementations but not by others. For this reason fasm does not object if you try to make one - after all, being able to control such details is what many consider the heart of assembly languages.